Jake is a transplant from the East Coast on a mission to make you smile out in the water. He has a background in comedy and acting, but don’t let him fool you he is a seasoned waterman. Jake can be found at anyone of our Los Angeles locations spanning from Santa Monica, Venice, Hermosa and Manhattan beach. 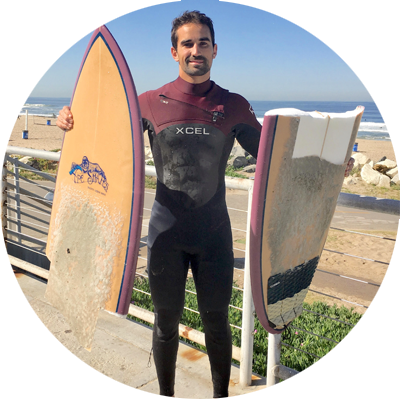 His goal is to get you surfing waves proficiently, safely, and wants you to have fun. He knows how challenging surfing can be for the novice because he has been there and wants you to get to the next level. Surfing with Jake will be something that you can check off your bucket list or make a routine habit that becomes part of your lifestyle.